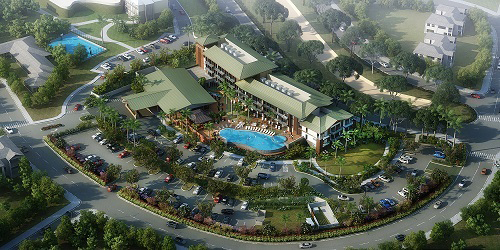 Here’s news about an interesting hospitality project getting underway in Hawaii. Ike Place Hotels has broken ground on AC Hotel Wailea, a 70k sf, four-story estate hotel located on the southside of Maui County in Wailea. Situated on a three-acre lot, the 110-room hotel will include one-bedroom suites and studio options, a business center, fitness area and infinity-edge pool complete with a poolside tiki bar and cabanas. The property is located at the corner of Wailea Ike Place and Wailea Ike Dr, adjacent to the Wailea Tennis Club. AC Hotel Wailea is in close proximity to The Shops at Wailea, which features 70 retail stores and myriad dining and entertainment options. Other nearby attractions include Wailea Blue Golf Course and Wailea Beach. The development is being built by R.D. Olson Construction, who is working with R.D. Olson Development, Architects Hawaii Limited and SAND Design on the project. Completion is anticipated for fall 2020.